Not ONE redeeming look. I've never seen such a downright ugly collection. 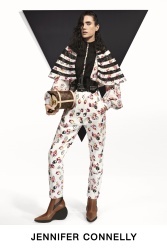 LV is really so big on celebrities they're getting them to star in lookbooks now? Wow! This collection shows two of the most annoying phenomenons of our era in fashion: Excessive brand ambassadors line-up and excessive layering. MAS needs to chill..like really! Cute pieces, weird styling and ugly shoes (ugly ugly). TaylorBinque, entten, GivenchyAddict and 1 other person like this. Insert random prints, insert puffy sleeves, insert weird shoes, insert excessive styling. LV collection done. The only though that comes to me is: "Ooh. When does GoT come back on? April, right?" The collection may be awful but can we all just take a moment to appreciate Jennifer Connelly absolutely working it?! When you launch a hideous collection of clothes, with horrible prints; and you use famous women as bait. This is even more notorious when you have to place the name of each famous woman under their respective portrait. My God!! Where´s the real Nicolas Ghesquière; and what did they do to him? dodencebt, entten and GivenchyHomme like this. kasper!, entten and jeanclaude like this. it would be a waste to give him his own line. he just doesnt have it anymore.....actually for a long time already.......I think the only reason why he is regarded as so talented is because of his few really uber orgasmic collections he did at Balenciaga. and then after those seasons I think his work acutally went down hilll at balenciaga already. but his impact for those few seasons was so strong that people still believe he is genius. He still deserve his own line. No matter what, he can cut a mean pair of pants and in terms of separates, he is still one of the best. There are some cute pieces in the stores. I hope that one day, MAS would come back to a more simple approach when it comes to styling. In terms of shoes, I need for him to work with PH again. 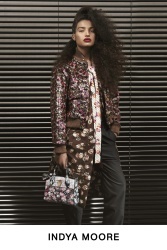 I personally think that the coats in this collection are just stunning! If in the summer I still have the one work by Urassaya on my mind, i might buy it! But how can we concentrate on the beauty of the pieces with such a busy styling and ugly shoes? His evolution as a designer might be weird but it’s the same for everybody. The majority of those highly regarded designers have already delivered their best work anyway. From Tom to Hedi, from Karl to Riccardo, from Alber to Miuccia...etc. Ruth Negga has the most tolerable look. Indya's and Urasayya's coats look pretty desirable, but the gratuitous styling ruins them. What on earth did he do here? It's strike two for Nicolas after the horrendous S/S 2019 collection. who is doing the shoes? So so happy for Urassaya. She looks gorgeous here. But that aside, all the shoes are ugly ugly. No but, just plain ugly. 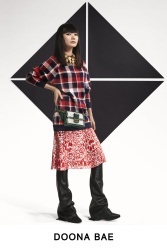 This collection is just same old boring things mashed up together and styled in the most excessive way. I guess the only thing worth talking about are the celebrities model. But that's how all headlines are about this collection anyway. 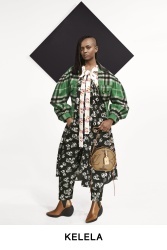 Seeing those three fantastic, gender ambiguous outfits in Spring 2019 gave me hope that Nicolas still has it; he just doesn't have the right vision and the right team for Louis Vuitton. GivenchyAddict and MetroMelannie like this. I feel like I’ve seen this collection a dozen times already, not only at Vuitton but also at Raf’s Dior and maybe even at Proenza Schouler or someone similar to them. entten, apple and Benn98 like this. Enough money for these, but still not enough to add Emma Stone here, if you are getting all your ambassadors?